Navy CAP Virtual Showcase - Dynaflow Inc.
Critical Navy operations rely on accurate predictions of vehicle maneuvering, simulation of the flow field around vessels, determination of propulsion system behavior, and proper characterization of the environment. These require accurate modeling and simulation of non-linear dynamic free surface flows, their interactions with nearby structures, and solution and diagnostics of two-phase flow problems. These are encountered with cavitation at high speeds or in off-design flow conditions, or with the detonation of underwater explosions. Dynaflow has developed several complementary tools and products to address these problems. Among them is 3DynaFSTM, a general purpose simulation tool for non-linear dynamic free surface flows and their interactions with submerged or floating structures. Under an ONR SBIR program, we are using 3DynaFSTM to model the wave dynamics and the motion of the Advanced Amphibious Assault Vehicle (AAAV) in the surf zone. 3DynaFStm has been developed and used for several Navy applications (for ONR and NSWC) including modeling and simulation of underwater explosions (UNDEX), cavitation inception and dynamics, noise generation in propulsors, non-conventional fish-like propulsion systems, etc. Off-line simulations using 3DynaFStm provide a database that is used in our ship simulator, DynaSimtm, to account for the interaction of breaking waves with a moving vehicle. 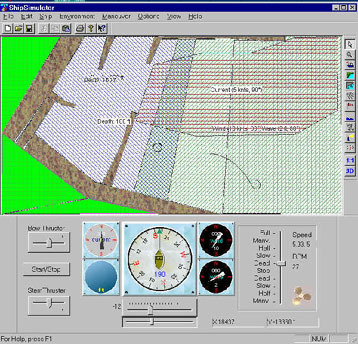 DynaSimtm is a real-time physics-based Windows NT ship simulator, which incorporates on-screen control and input of water depth, waves, currents, bottom, nearby wall effects, etc. Cavitation, noise generation, and UNDEX effects are due to the explosive growth and collapse of extremely dynamic bubbles. These are highly nonlinear free surfaces that can be simulated quite accurately by 3DynaFStm. Such simulations have been shown to correspond very well to Navy UNDEX data, and to Dynaflow data obtained in our spark-generator facility and in our wave tank. Ocean background noise and propeller cavitation inception depend strongly on the presence of micro-bubbles (nuclei) in the water. Accurate predictions and extension of laboratory results to full-scale require knowledge of the nuclei size distribution. In order to address this need, we have developed the ABS Acoustic Bubble Spectrometer®, a PC-based device that measures bubble size distributions and void fractions in liquids. The underlying acoustic technique is very sensitive to bubbles but effectively insensitive to particulate matter. The ABSÒ can be used in a wide variety of two-phase flow applications where knowledge of the bubble size distribution and the volume fraction and/or area of contact between the gas and the liquid is important. Increased use of "virtual" training/simulation and computational modeling in the design process. Increased military operations in the littoral regions, and particularly the surf zone, where waves, shallow water, free surfaces and complex boundaries are important. Increased use of unmanned autonomous vehicles, particularly in shallow water. Decreased ability to conduct actual explosion tests due to cost, safety, and environmental concerns. Reduced vessel noise and increased acoustic detection capabilities resulting in the need to further delay cavitation inception and to account for nuclei distribution for scale-up predictions. ONR, Air Force, NAVSEA, NASA, DARPA: fluid/structure interaction studies for development of MEMs. DoD, Air Force, NIH, NASA: biomedical applications addressing the potential for bubble formation due to decompression, transfusion, operations, etc. DoD, DOE: experimental validation of numerical design and simulation models of multiphase processes. EPA, DOE, DoD: environmental related applications – bubble population being an indication of the amount of aeration, etc. Most current Computation Fluid Dynamics codes are based on variations of finite difference or finite element methods, which are highly developed for modeling single-phase flows. They are not specialized to study cases where the details of liquid/gas interfaces are important. These codes are also computationally intensive and require supercomputers running for many days to simulate 3D problems. Most ship simulators are full mission simulators, equipped with a full size ship bridge, and able to display "virtual reality" scenes. They are very impressive but very expensive and complex. The mathematical models used in the simulators are based on the simplifying assumption of linear small free surface deformation, and are not adequate to model vehicle behavior in the surf or transition zones. Several techniques exist to evaluate the bubble size distribution in liquids. Low-tech methods include light and sound attenuation and photography. High-Tech approaches consist of optical technologies (scattering, fiber-optic probes, holography), acoustic technologies (scattering, attenuation, dispersion), and others (electrical impedance, cavitation susceptibility). Acoustic methods take advantage of the fact that the acoustic cross-section of a bubble is three orders of magnitude greater than its geometrical cross-section. However, they are inverse methods, and have the difficulty solving the resulting ill-posed problem. It uses sea states and topographic configurations input to determine wave elevation histories and particle velocity distributions in the surf zone. It calculates the hydrodynamic forces acting on the vehicle, vehicle added masses and momentum coefficients, including breaking wave-induced forces on the vehicle. DynaSimtm can also be further developed as an autopilot for marine vehicles. An additional important feature of DynaSimtm is its incorporation of a multi-objective system identification technique to determine the vehicle parameters. This would enable the autopilot to adjust the vehicle parameters based on feedback from the ship response to the pilot commands. The ABS Acoustic Bubble SpectrometerÒ is a PC-based device that measures bubble size distributions in liquids. It uses a mathematical model to regularize the ill-posed inverse procedure of retrieving bubble populations from acoustic phase velocity and attenuation of various frequency acoustic bursts. The advantages of the ABS Acoustic Bubble SpectrometerÒ over optical techniques are its high sensitivity to bubbles, ability to operate without requiring a transparent liquid or container, and ease of use. The device consists of a set of two hydrophones connected to boards resident on a PC, which controls signal generation by the first hydrophone and reception by the second. Short bursts of sound at different frequencies are transmitted and received after passage through the liquid. These signals are analyzed utilizing copyrighted algorithms to obtain the attenuation and phase velocities of the acoustic waves, and, from these, the bubble size distribution. A user-friendly Graphical User Interface (GUI) allows for easy control and measurement using a series of dialog boxes. The results are displayed graphically in real time and can be stored or printed. Initial versions of 3DynaFStm are complete and in use. Various upgrades are in progress. A preliminary version of DynaSimtm is available. Further development is planned. Surf Zone simulation software is in the middle of a Phase II SBIR for the USMC via NAWC/TSD (Orlando) that should be completed in mid 2001. A first version of the ABS Acoustic Bubble SpectrometerÒ is complete. Several units have been shipped and are in use by customers. Current efforts are directed at further improving both the software and hardware to increase its versatility and ease of use. Continuing development efforts seek to provide the capability of bubble population measurements in non-Newtonian media such as blood, tissue, and visco-elastic/visco-plastic fluids and for larger void fractions. Chahine, G. L. and Hsiao, C-T. "Modeling 3D Unsteady Sheet Cavities Using a Coupled UnRANS-BEM Code," 23rd ONR Symposium on Naval Hydrodynamics, Val-de-Reuil, France, September 2000. ABS Acoustic Bubble SpectrometerÒ User Manual 7-012, Version ß 3.0, Dynaflow, Inc., May 2000. Kalumuck, K. M., Chahine, G. L., and Goumilevski, A. G. "BEM Modeling of the Interaction Between Breaking Waves and a Floating Body in the Surf Zone," Proceedings, 13th ASCE Engineering Mechanics Conference, Baltimore, MD, June 1999. Chen, J., Goumilevski, A. G., and Chahine, G. L. "A 3D BEM Simulation of Breaking Waves on a Gentle Beach", Proceedings, 14th Engineering Mechanics Conference EM2000, ASCE, Austin, TX, May 2000. Goumilevski, A. G., Cheng, J., and Chahine, G. L. "Wave Breaking on a Sloping Beach: Comparisons Between Experiments and Simulations ", Proceedings, 14th Engineering Mechanics Conference EM2000, ASCE, Austin, TX, May 2000. Chahine, G. L., Hsiao, C-T., Kalumuck, K. M., and Cheng, J., "3DynaFStm Navy Version DFBEM©: A Three-Dimensional Free Surface and Bubble Dynamics Code," User Manual, March 2000. Chahine, G. L., Hsiao, C-T., Kalumuck, K. M., and Cheng, J., "3DynaFStm Navy Version DFBEM©: A Three-Dimensional Free Surface and Bubble Dynamics Code," Developer Manual, July 2000. Dynaflow, Inc. has been serving the industrial and military market since 1988. The company has established a reputation for quality R&D and testing work. The company attempts to follow an inter-disciplinary approach to problems, using a combination of scientific tools to achieve results. This fact is reflected in the diversity of research at Dynaflow, Inc. Other than contracts on hydrodynamics and CFD research from federal agencies (ONR, NSWC, NASA) and consulting and testing jobs from industry, Dynaflow, Inc. has developed under internal funds and SBIR awards, several products that it is seeking to market. These include a ship simulator; a multi-purpose boundary element code suite for the study of fluid dynamics, gas/liquid interfaces, and fluid structure interactions (3DynaFStm); an acoustic tomography instrument for bubble size measurements (ABS Acoustic Bubble SpectrometerÒ); cavitating jet systems and nozzles for cleaning, cutting, drilling, and for oxidation of organic compounds (DynaJets®); electrical impedance tomography software; improved systems for trace gas concentration; and a cross-flow filtration system (DynaPerm®). Dynaflow, Inc. has extensive experimental facilities for fluid dynamic investigations including flow visualization, high-speed photography, spark generated bubble dynamics for simulation of underwater explosions and cavitation, high pressure water jets, a wave tank, and an erosion and high impact materials testing laboratory.